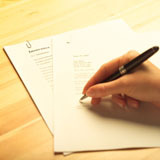 Five cover letter tips you can use A.S.A.P. This article will go over simple strategies you can use to create a powerful (and succinct) cover letter. Job seekers frequently wonder how to structure this document. Is it separate from a resume? Do I really have to go through the process of creating an entirely new one for every job I apply to? We’ll dispel some of these myths, keep things simple and hopefully get you well on your way to landing more job interviews. 1. Address it to a person whenever possible. While you can always start a cover letter with “Dear Sir/Dear Madam” this should only be used as a last resort. I can’t stress enough how much of a difference addressing the cover letter to a real person makes when submitting to jobs. Not only does it leap out amongst a sea of anonymous submissions, it sends a clear message that you’re willing to go above and beyond for this opportunity. Check the job posting carefully to see if a hiring manager is listed. Check the employer’s website. If you’re submitting through a connection who works at the company, ask him or her to obtain this information. The extra time you spend here can pay off exponentially in the form of more interviews. 2. Understand a cover letter’s function. The sole purpose of a cover letter is to pique the interest of the employer to read your resume. Don’t make the mistake of inserting skills and details that can’t be easily followed-up in the resume. Instead, think in terms of creating a “teaser," a very brief introduction that communicates the job position you’re applying for, contains a few relevant skills and accomplishments pulled directly from your resume and promises a follow-up within a stated period of time. Utilizing this approach is the best way to prevent confusion on the part of recruiters and hiring agents, who often scan hundreds of resumes for a particular position. As a General Hotel Manager, I managed the hotel's overall operation through maintaining established cost and quality standards, maximizing profits, developing and retaining employees and exceeding guest expectations. I am confident in my abilities to excel as a leader at your hotel. *Quick Tip: Play up those skills which are mentioned frequently in the job posting (and which you possess). This immediately shows that it’s not a “blind” submission while underlining your suitability for the job. 4. Include three to four career highlights. • Managed all sources of revenue including guest rooms, housekeeping, food and beverage, engineering and other departments. Ensured all departments are profitable and maintain strong working relationships. Including a few career highlights makes an immediate impact in terms of presentation and content…and that’s exactly what you want for a cover letter. Clearly setting a timeframe with regards to following up and then actually doing so, is something many job seekers neglect to do. Truth is, following up can mean the difference between your submission getting lost in the shuffle and a job interview. Please accept this letter and enclosed resume as an introduction to my skills and background. For a more detailed presentation of my offerings and how I can best benefit your organization, feel free to contact me at your earliest convenience to schedule a conference. I’ll also follow up with you in two weeks’ time regarding my candidacy. Thank you in advance for your consideration and I look forward to our conversation.